The Thermo QuantStudio 5 Real Time PCR system provides reliable, user friendly, high performance that’s ready to go right out of the box. This qPCR system is an ideal choice for labs needing flexible dye selection, 21 CFR Part 11 compliance, and the ability to collaborate. The QuantStudio 5 features a sleek, compact design, preloaded with software that never needs updating, and an easy to navigate, graphical touch interface to guide users through preoptimized protocols. This real time PCR is capable of detecting differences in singleplex reactions as small as 1.5-fold, collecting 10 logs of liner dynamic range. The Thermo QuantStudio 5 Real Time PCR lets users access, analyze and share their data from anywhere, through web browser software, or through mobile smart devices, through the instrument connect app, or to a co-located PC. Maintaining compliance standards is simple with this qPCR, thanks to locked protocol templates for tight control, real time quality control feedback, and traceablity of consumables. Users can also enable registered user PIN accounts for added security. This real time PCR also features fast thermal ramping at 6.0°C/sec with an average sample ramp rate of 3.66°C/sec. Runs for this PCR system is completed in as little as 35 minutes. 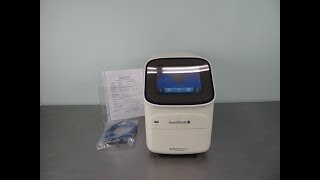 This 2015 Thermo QuantStudio 5 Real Time PCR Cat# A28135R comes with it's original packaging and comes with a diagnostic report and clean bill of health. All of our lab equipment comes with our standard warranty. Should you have any questions please dont hesitate to contact us.